As a Restorative yoga teacher, we can enhance these qualities for our students by the way we approach, and relate to, the practice. 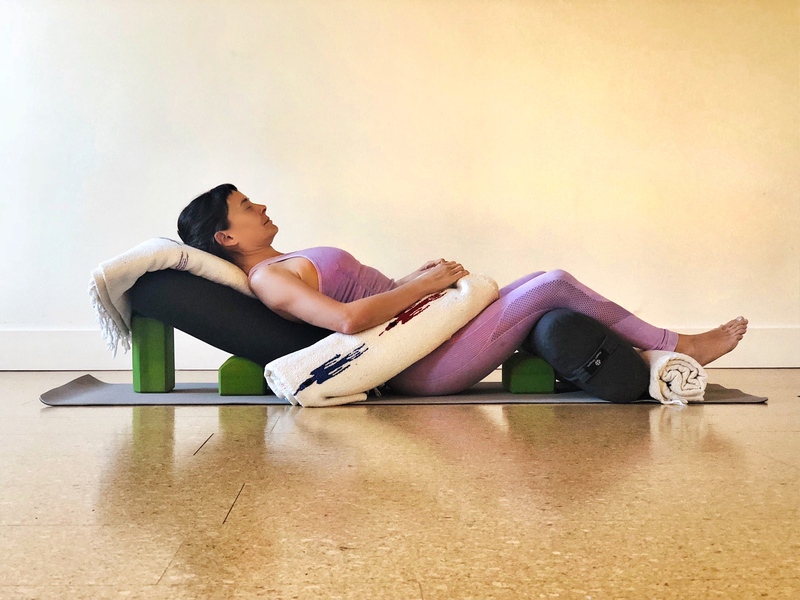 I’ve found through both practicing and teaching Restorative yoga, that attention to detail can be the difference between a good restorative class and a great one. In fact, attention to detail is the impetus for the profound letting go that Restorative yoga is known for. Below are three crucial factors that I believe should be incorporated. They are prop detail, honoring the nature of the practice, and extending care. If you pay attention to these three factors you will shine as a teacher and optimally offer the benefits of this powerful practice. If the Restorative practice has taught me anything about yoga and life, it’s that the more specific and attentive I am, the more freedom I experience. Think of it like a relationship, where clear communication and boundaries inspire a sense of freedom and ease. Same goes for this practice. 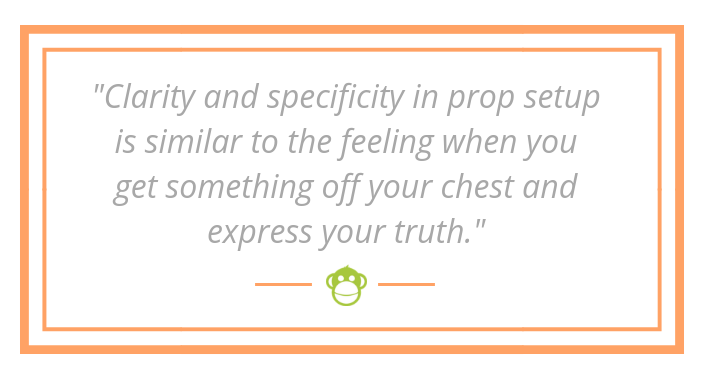 Clarity and specificity in prop setup is similar to the feeling when you get something off your chest and express your truth. Props = boundaries. Props are the very thing that create the container for the student to experience relaxation within. The more time and attention put into prop setup prior to settling into the pose, the less distraction the student will experience in the time that they are holding the pose. Bottom line: be meticulous. It may feel overboard but it’s worth it. I like to think about symmetry and support when I’m setting up the props. The props should work to meet the body, rather than the body working to meet the props. Build the props up to the student as much as needed so they don’t have a sense of holding their body up or unnecessarily engaging their muscles in any way. Set up the props in an even manner so the student can hold the pose symmetrically, bringing the body into balanced alignment. Props are what encourage the body to find this balance. If you practice Restorative yoga yourself, you know how important props are (the more, the better!). If you can teach from that place of belief in the props you’ll have more confidence. Bottom line: The student’s comfort is your number one priority. Props are the ticket to that comfort. Pratyahara is a great companion to the Restorative practice. Pratyahara is known as ‘sense withdrawal’, though we might say pratyahara is an engagement of the senses. Rather than a complete withdrawal, pratyahara in the context of Restorative yoga is a withdrawal from the input of the senses. It can be thought of as limiting external stimulation or distraction (within your control) so that you may pull your senses inside and quiet your nervous system. This is the difference between jolting at the sound of a water bottle falling versus feeling little to no shock in your system when it happens. Restorative shifts us from a reactive state (being low-key shocked at a sudden noise) to a responsive one (noticing the sound without being affected as much or for as long). The state of our nervous system – is either on guard (sympathetic nervous system) or relaxed (parasympathetic nervous system). 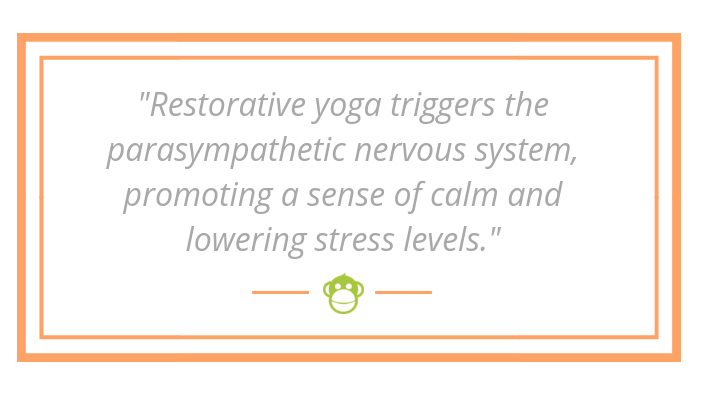 Restorative yoga triggers the parasympathetic nervous system, promoting a sense of calm and lowering stress levels. Doesn’t that sound like just what we need? The practice puts the pause button on the number of stimulants we add or set off in our bodies (coffee, stress, busyness, etc.) – shifting us from being on edge to backing away from our edge. Let the practice speak for itself. Think of ways you can create a space that will help your students sink back into their subtle awareness. Think: consistent and calming. For me, this comes in the form of: either no music or very soft, consistent ambient-style music; little to no assists, periods of no talking so that there is space and silence for the student to just be. All of these factors allow the students to be in their own experience and, over the course of the pose, fully immerse in that experience rather than being taken out of it by a sudden change in music, touch, smell, etc. The more of these you can incorporate in the practice, the more your students will find the deep rest they are looking for. Promote stillness in the way you set up props prior to resting in the pose. 3. CARE. IN DIFFERENT WAYS. When we feel safe, we let go. We release our tense muscles and our stressful thoughts and we r-e-l-a-x to the max. I like to think of this as a mothering practice. When we support ourselves with props, it’s like we are being held by someone we love. We are learning, through this practice, to give back to ourselves. We are mothering ourselves. So, as a teacher, how can you think of yourself as a mother figure – one who is caring, compassionate, observant, and insistent on their student’s comfort, safety, and space? Don’t be afraid to ask your students, more than once, if they feel comfortable or if they need anything. It exhibits your care and fosters a sense of trust between you and your student. Not a restorative teacher yet? Our Restorative Yoga & Private Lesson Module is coming to Boulder, Colorado this March! Find out more info below! Sarah Diedrick is a writer and yoga educator. 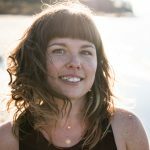 She leads classes, retreats and trainings around the world and serves as a mentor to yoga teachers who are looking to refine their skills and sustain their inspiration. Sarah is currently working on a book and teaching yoga full time. She is also working toward her 500-hour certification with 90 Monkeys!